WEB SITE: Phelps Media Group, Inc. Press Releases and Photos are available for download at http://www.phelpsmediagroup.com/ Photo may only be used in relation to this press release. Photo Credit: Co-Grand Pony Hunter Champions at the Washington International Horse Show – Mokoo Jumbee ridden by Paige Dekko and Everwood ridden by Naomi Weirens. Photo © 2006 by Jennifer Wood. This photo may be used free of charge only in relation to this press release. Washington, D.C. – October 29, 2006 – Some of the top ponies in the world competed in the final day of competition at the 48th Annual Washington International Horse Show, as well as the top pony and horse hunters from the local area. Along with Small, Medium and Large Pony Hunter Championships, there was a Grand Champion Pony Hunter presentation, along with the WIHS Pony Equitation Finals and the Local Pony and Horse Hunter Finals. Two top ponies tied for the Grand Pony Hunter Championship. Mokoo Jumbee and Paige Dekko and Everwood and Naomi Wierens won in the respective divisions and will both take home the top honors. Wierens was also awarded with the Best Child Rider on a Pony title. Eleven year old Hillcrest’s Blue Gemstone (Gem) was Small Pony Champion. “I have been riding him for two years but my mom (Mindy Darst – Lochmoor Stables) has had him a long time,” said pilot Meredith Darst. “He tries to bite me in the barn, and he likes mints. Actually, he eats everything,” she laughed. This is the second time that the eight year old “Mattie” has competed at WIHS. “This is my first time being champion at an indoor show,” she said. Her dad Greg was there to cheer her on along with her sister and trainer Jenny. “All of her clothing was lost by Delta, so her entire outfit was sponsored by friends today,” Greg noted. “Her mom wants to be here today, but she is in the hospital. Hopefully, she is getting out of the hospital today,” he said. “I thought about my mom today, and she called me before I showed,” Mattie replied. The Reserve Champion Small Pony Hunter was Prince Monticello, owned and ridden by Noel Fauntleroy. The Medium Pony Champion was Everwood, better known as “Gus,” a nine year old gelding piloted by Naomi Weirens. “I have been riding him for two years,” Weirens said. “He is really fun to ride because he is so scopey, and he jumps really well.” The pair lives in Bronxville, NY, and it was her third time competing at WIHS. The Reserve Medium Pony Hunter Champion was Denmark, ridden by Katherine Galbraith for Manahattan Mortgage. Large Pony Champion Mokoo Jumbee, ridden by Paige Dekko, was second in every class today. Their consistency paid-off, and the bridesmaid ended up being the bride when they were awarded Large and Grand Pony Hunter Championships. “I am always a little bit nervous when I show,” Dekko said. “But, once I started my course, I knew that Mokoo would take care of me well. He is very good indoors even though he gets a little bit scared in the tight quarters of the warm-up ring,” she explained. Right now Mokoo Jumbee is leading the country in the race for Large Pony of the Year. The Reserve Large Pony Hunter Champion was Winston, ridden and owned by Samantha Schaefer. The WIHS Pony Equitation Classic victory went to Alise Oken of Charlotte, NC. The 14 year old rider piloted Land’s End Mad Hatter to the win. After a solid over fences round, Oken went into the flat phase in first place and retained her ranking. It was her first big win at an indoor show, and she is planning to move up to horses next year. “Bubba” will move onto a new rider, Oken’s little sister Lillian. In the Local Pony Hunter Finals, the Grand Championship was awarded to Woodland’s Me First and Hannah Spiegler. Spiegler leases the 11 year old grey gelding from Don Stewart Jr. and rides with Pam Baker and Elizabeth Coughlin. Spiegler and “Woody” were champions at last weekend’s competition in Upper Marlboro, MD. In today’s final class at the Verizon Center, they finished second. The reserve championship went to Hallie’s Comet and Isabella Norton. The Local Hunter Finals Grand Championship was the final class of the 2006 WIHS, and the prize went to Dark Star and Alison Wherley, who rode for Terri Wherley. Wherley has ridden the handsome bay gelding for four years and they have forged a solid partnership. A second place at Local Weekend qualified them for the finals in the Verizon Center, and it was their winning round today that garnered them the Grand Championship. The reserve championship went to LeGrand, ridden by Bari Friedman for Mackenzie Green. 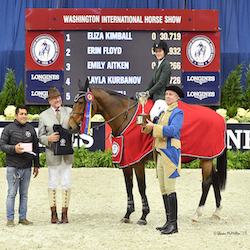 The pony and local championship classes were the finale to a fun packed week at the 48th Annual Washington International Horse Show at the Verizon Center. The audience was large and enthusiastic throughout the entire six days of competition. The production staff kept everything moving smoothly and held the interest and attention of everyone watching. Barn night and the Puissance competitions drew in crowds that were deafening. Even the European riders (who are used to an enthusiastic audience) commented on the level of cheering and support that the spectators had in 2006, and everyone looks forward to an even better 2007.